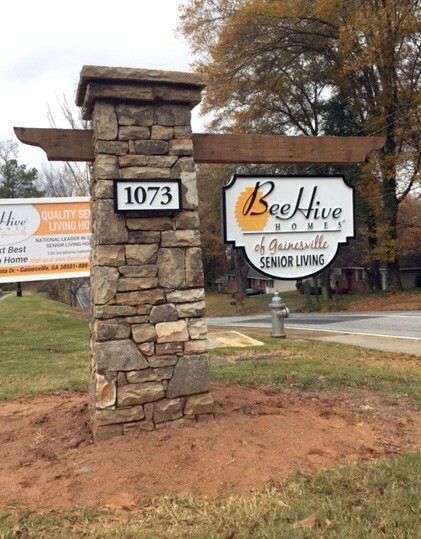 Beehive is a national assisted living franchise with numerous locations. The entrances to these facilities typically have real brick and mortar block stone monument column marquees with suspended embossed sign panels under wooden post arms that welcoming incoming traffic. They require break away sign monuments, meaning if impacted by a vehicle, the sign will literally “break away” from its footer and not harm the driver. There is an ongoing issue with sign monuments and liability for businesses (and all other entrance-style sign monuments including city municipalities). The monument owner may be liable for driver injury and vehicle damages incurred by vehicle impact, especially in fatal incidents. So if an elderly driver hits your sign and is injured – the facility owner may be liable. There is a simple solution to this situation which is referred to as a “break away” style sign monument. This means on impact, the monument itself will literally break off the ground and move out of the way, causing minimal vehicle damage and preventing fatal injury. All of our sign monuments are a break away solution, and in our company history there have yet to be any injuries on impact. Beehive Block Stone Sign Column Monument. Break Away Sign Monuments. 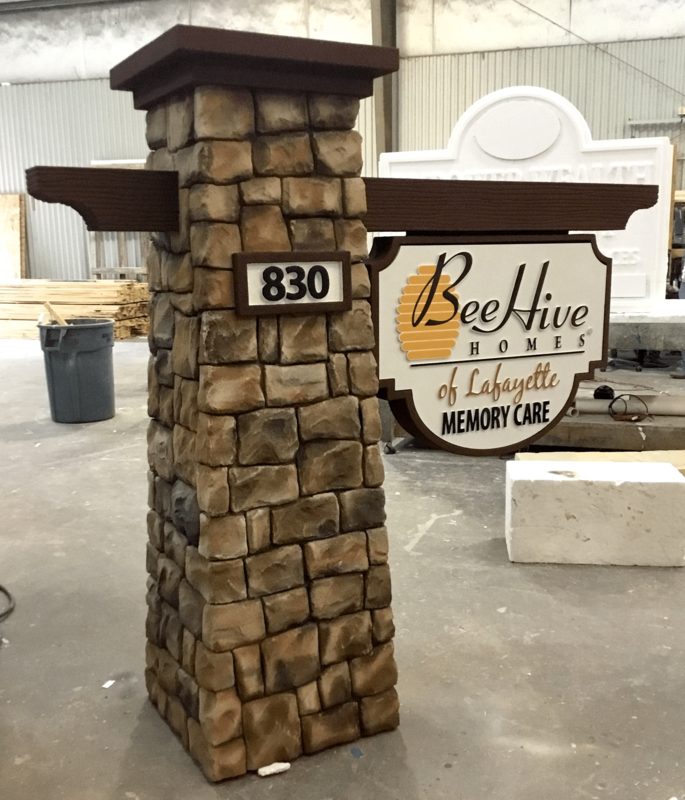 Beehive Break Away Faux Block Stone Sign Column Monument. Break Away Sign Monuments. As you can see the faux masonry is a fantastic match to the real stone and mortar. We attached the embossed sign panels we fabricated in a permanent method (versus hanging from chain) to prevent theft or wind damage. Custom break away sign monuments are safe, and provide a sense of distinction and permanence to your property. Our sign monuments are the style most desired and required by municipalities nationwide for an all over better looking community. With over (2) decades of nationwide success, we will make You Look Your Best! We welcome any challenge in custom break away sign monuments, and can produce anything you can imagine! Please use our online contact form to start your next sign project. We look forward to working with you! This entry was posted in Break Away Signs, Business Signs, City Municipality Signs, Commercial Signs, Completed Sign Projects, Monument Signs, Property Developer Signs, Residential Signs by BSM Staff. Bookmark the permalink.